I forgot how hard it is to ride the White Rim in one day. 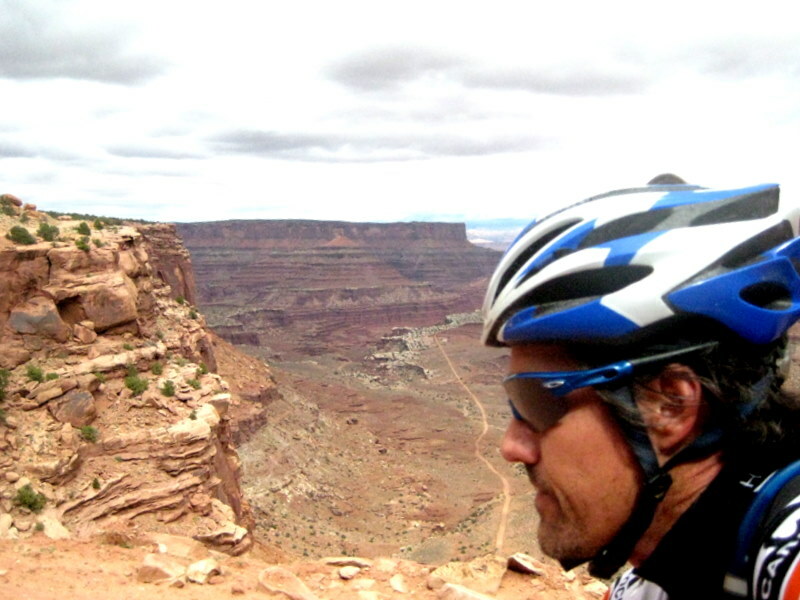 I did the Moab Rim Ride last month (not to be confused with the White Rim) and felt great even after 10hr 30min of riding. In contrast the White Rim only took about 8 hours and while I felt great afterwards I really suffered for about an hour from miles 40-50, I mean really suffered. 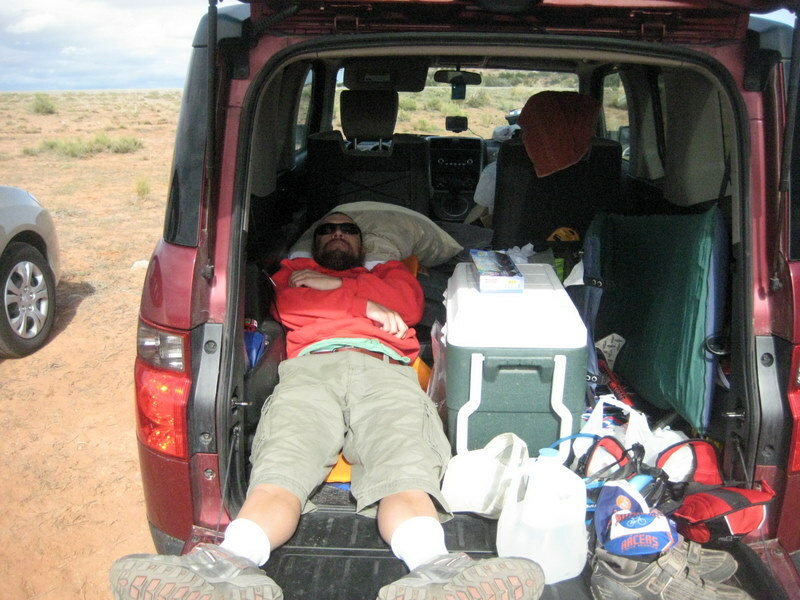 I’m telling you the Moab Rim Ride was easier. You would think that after having ridden the White Rim literally dozens of time over the years that I would remember how hard it is. No. I disrespected it and it punished me. Nine of us started at 8:30 and rode counter-clockwise. We all had our own personal goals and the social aspect of the ride ended abruptly after what could loosely be called a “neutral” roll-out when we descended Horse Thief after about 12 miles. Adam and Rick S took off down the switchbacks too fast to witness the carnage of Aaron’s crash. It must have looked a lot worse than it turned out to be as he was somehow able put himself back together and actually finish the ride, I woulda bailed for sure. After making sure Aaron knew how many fingers he had and that his bike was working the rest of us took off. I chased as hard as I could and wouldn’t see Rick until the bottom of Murphy’s Hogback nearly 40 miles later. I had been pedaling so fast and furious to try and catch those two that by the time I did I completely imploded and then they were both gone again not to be seen for a very long time. I thought the White Rim TT would also be a great time to test out a future product, lets call it CR 350, and really wasn’t sure how things would play out. I had mixed 4-24 oz water bottles with 300 calories each and planned on drinking one bottle per hour. I also had the equivalent of 3-24 oz water bottles in my Camelbak mixed to 350 calories each. I failed to take in enough of the mix in the first few hours with only 2 bottles consumed by Murphy’s. I completely seized up at Murphy’s. 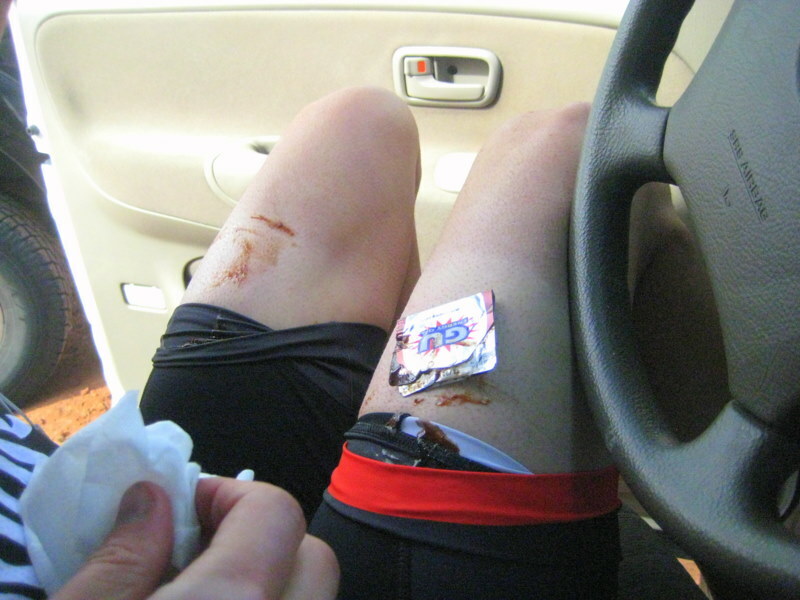 Lesson quickly learned, I need more calories per hour than 200. I started downing the higher calorie content drink and began to feel much better. So much better that over the next 3 hours or so I would eventually catch up to Rick S and Adam. I felt like a million dollars for those last few hours, literally better than I had felt all day and would finish in 8:05 feeling great. There were several other groups doing the White Rim that day all starting from different places and times but all had to pass the spot where our group started and finished so I got to cheer on a few fellow White Rimmer’s. Here’s some of my favorite pics. 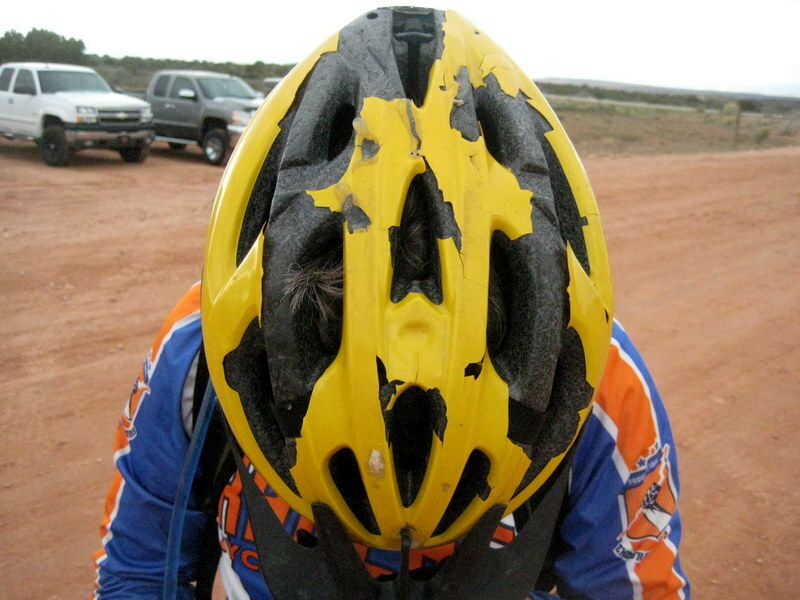 Bry Christensen, possibly the nicest person in the world, needs a new helmet. Yes, I’m starting a fund raiser for Bry. I really want him to get a new helmet don’t you? If you look close you can even see hot glue gun glue holding his helmet together in various places. He’s worn that same helmet for the last 13 years, gross. Ever wonder what to do with used GU packets? Solution: make sure to invite Rick S. along for the ride, he collects them. In his shorts no less, weird. I can’t tell you how many times I’ve seen Adam in this position after a monster ride, he always looks so comfy as if he’s been eating bon-bon’s all day and sipping fine cognac. I’m already obsessing about doing this again, trying for 7:30. I’m thinking a harder gear. The 34×20 was good for the climbs but 95% of the ride begs for something bigger. I think I’d rather walk a few more of the climbs and go faster on the flats. I’ll also buy a watch with a timer to remind me to drink that 350 calories an hour. How does end of May or first of June sound? I never tire of this ride. It’s always a blast and it always hurts. I think I’ve done it a couple times a year for the last 10 years or so. Recently, as in the last few weeks, I’ve become obsessed with how fast I could do the whole loop in one day. Chris Plesko just posted a 7:59 which seems really fast to me so that’s gonna be my benchmark. I don’t care about any rim to rim times. I’m only interested with the time to complete the entire loop. I’ve heard talk in the past about fast times only to then hear it was rim to rim and not the whole loop. If you’ve got a fast time I want to hear about it. While I’m doing the loop this month I won’t be time trialing but just having a good time as part of the annual RAWROD event. Of course, there will be competitions like who can ride Murphy’s, Hard Scrabble and Horse Thief without dabbing and who can eat the most brats the night before. I’m pretty sure whoever wins the brat contest won’t be a contender for the other contests. I could be wrong. So, how fast has the White Rim been done and in which direction?